Catwoman is a fictional character associated with DC Comics' Batman franchise. Historically a supervillainess and often an antiheroine, the character was created by Bob Kane and Bill Finger, partially inspired by Kane's cousin, Ruth Steel, as well as actress Jean Harlow. The original and most widely known Catwoman, Selina Kyle, first appears in Batman #1 (Spring 1940) in which she is known as The Cat. She is usually depicted as an adversary of Batman, known for having a complex love-hate relationship with him. In her first appearance, she was a whip-carrying burglar with a taste for high-stake thefts. 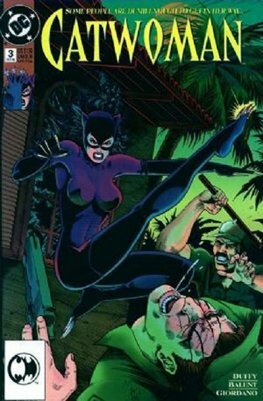 For many years Catwoman thrived, but from September 1954 to November 1966 she took an extended hiatus due to the newly developing Comics Code Authority in 1954. These issues involved the rules regarding the development and portrayal of female characters that were in violation of the Comics Code. 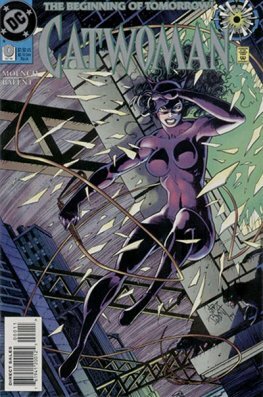 Since the 1990s, Catwoman has been featured in an eponymous series that cast her as an antiheroine rather than a traditional villain. The character has been one of Batman's most enduring love interests. A popular figure, Catwoman has been featured in most media adaptations related to Batman. Actresses Julie Newmar, Lee Meriwether and Eartha Kitt introduced her to a large audience on the 1960s Batman television series and the 1966 Batman motion picture. Michelle Pfeiffer portrayed the character in 1992's Batman Returns. Halle Berry starred in a stand-alone Catwoman film, 2004's Catwoman, which was a box-office flop, and bears little to no resemblance to the Batman character. Anne Hathaway portrayed Selina Kyle in the 2012 film The Dark Knight Rises and, most recently, a young version of Kyle is played by Camren Bicondova on the 2014 television series, Gotham.